LONDON, UK, February 22, 2012 (ENS) – The Internet retail giant Amazon.com has responded to a public outcry against whale meat sales on its Japanese website by removing more than 145 food products from the site overnight. The products made from the meat of whales, dolphins and porpoises were removed within 24 hours after a campaign launched yesterday by the Environmental Investigation Agency and Humane Society International quickly gathered worldwide momentum. Tens of thousands of people took action via Twitter, Facebook and HSI’s online petition and thousands more sent protest emails to Jeff Bezos, founder and CEO of the Seattle-based business. “We welcome Amazon’s action to remove whale products from its Japanese website but urge Amazon to confirm it will enact a company-wide ban on the sale of all products derived from whales, dolphins or porpoises,” said Allan Thornton, president of the Environmental Investigation Agency, a nonprofit organization based both in the UK and the United States. “Amazon.com’s Unpalatable Profits,” the EIA report that created the backlash against Amazon Japan, reveals that the wholly owned subsidiary of Amazon Inc., sold cetacean food products despite Amazon’s stated policy of prohibiting the sale of unlicensed or illegal wildlife products, including endangered species. 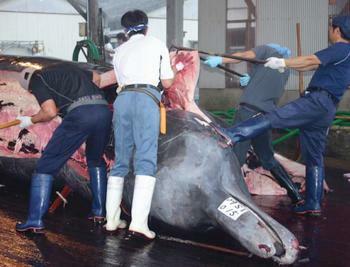 In December 2011, EIA investigators identified 147 whale products for sale on Amazon Japan. Links to these products were active on the Amazon Japan site yesterday. But today the same links return a “404 File Not Found” message. The listed products included fin, sei, minke and Bryde’s whales, all protected by the International Whaling Commission’s moratorium on commercial whaling and the Convention on International Trade in Endangered Species, which forbids international trade in body parts of endangered fin and sei whales. In 2011, EIA investigators purchased whale products from Amazon Japan, including canned whale meat, whale jerky, whale bacon and whale stew, some from these endangered species. Many of the products were found to be contaminated with toxic mercury at levels far higher than Japan’s allowable limit. “The most popular product at the time of research was coastally caught Baird’s beaked whale jerky, sold by Hakudai company. The second most popular item, also a Hakudai product, was Icelandic fin whale bacon,” the EIA report states. 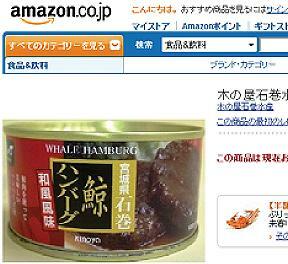 Amazon Japan profited from the sales of whale meat. Selling contracts on Amazon Japan require third-party sellers to pay a 10 percent commission for food and drink products, including whale products, on top of a 4900 yen ($57) monthly fee, according to the EIA report. Product prices ranged from ¥340 (£2.81 or US$4.23) for “gondou” whale tail skin, which indicates pilot whale or Risso’s dolphin, to ¥31,500 (£261 or US$392 ) for a ‘Hot pot variety set of whale meat and whale sashimi’ sold by Iwatani-i-collect, the EIA reported. The groups also released a short campaign video urging consumers ask Bezos to “immediately and permanently ban” sales of all cetacean food products from Amazon Japan.